Highway 61 Attic Art Gallery, Vicksburg, entranceway. 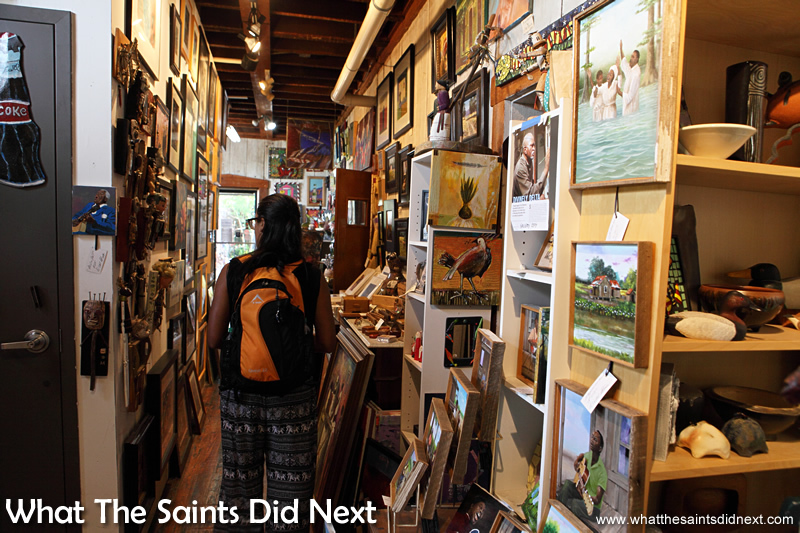 The Highway 61 Attic Art Gallery, Vicksburg, Mississippi, showcases provocative southern painting styles by Mississippi artists and surrounding areas, plus a whole range of other fascinating creative art work. 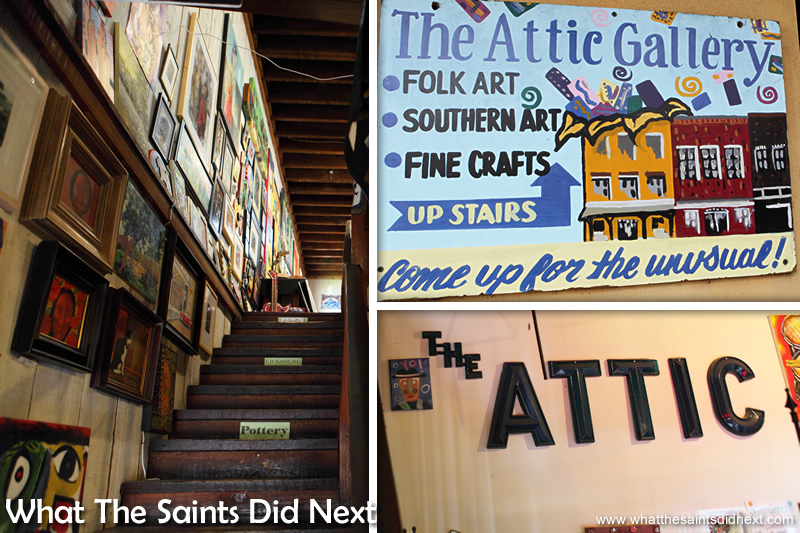 The Attic Gallery is one of the cool indoor things to do in Vicksburg Mississippi, hidden away almost above the Highway 61 coffee shop. We had just one day to visit Vicksburg, but I’m so glad we got to sample this facet of US southern culture at the Highway 61 Attic Art Gallery. 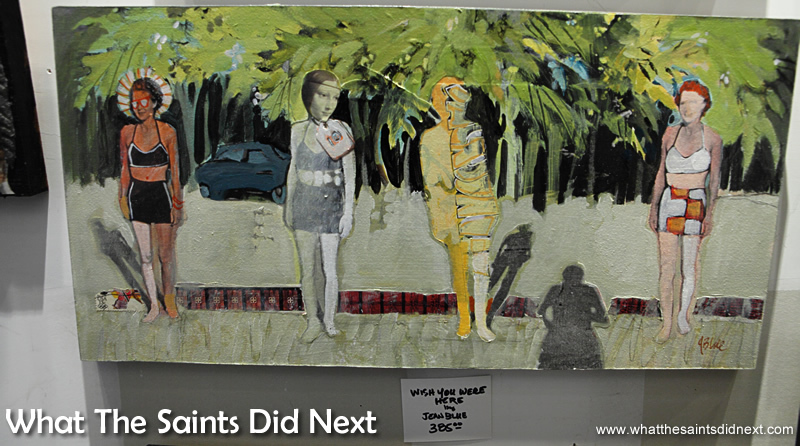 It’s a 44-year-old ‘Aladdin’s Cave’ of artwork that really grabbed our attention. The Highway 61 Road Trip in the USA is famous among fans of the blues. It traces the history of blues music, running south to north, taking in music shrines like New Orleans, Memphis and Clarksdale. Our own Mississippi river road trip overlapped in places with US Hwy 61, and at one of these converging points, Vicksburg city, we chanced upon this lovely gallery. Even with my severe deficit of drawing or painting talent I can still appreciate the artistic ability of others, and especially the trend now-a-days for alternative art styles. These provocative styles make visiting galleries and art shops an inspiring experience. Admittedly, even with an open mind, I still have my limits. Like the time I saw a pile of elephant poo in a glass box at the Tate Modern. But that’s another story altogether! Mississippi artists and other southern painting styles on display. A mouse in the house? You can have them for just $10 each. A core group of American artists exhibit at the Attic Gallery. 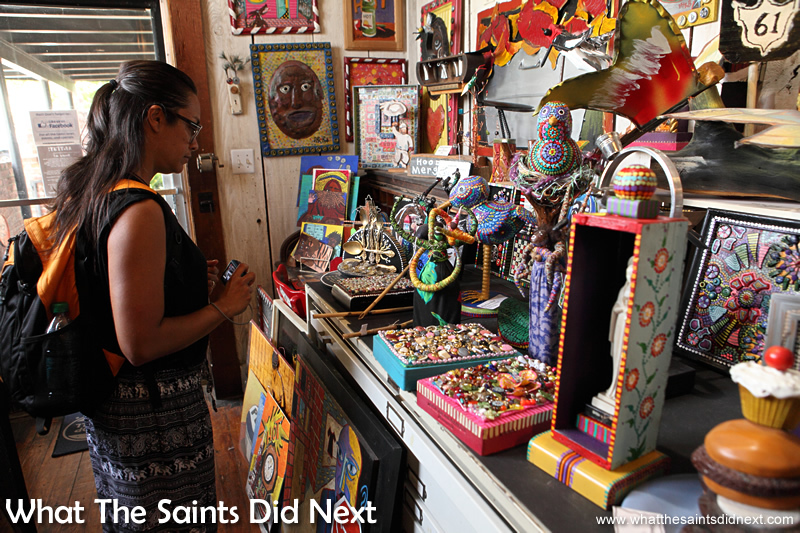 Everything from water colours and traditional oil on canvas creations, to mixed media paintings and 3D art assembled from recycled household junk. 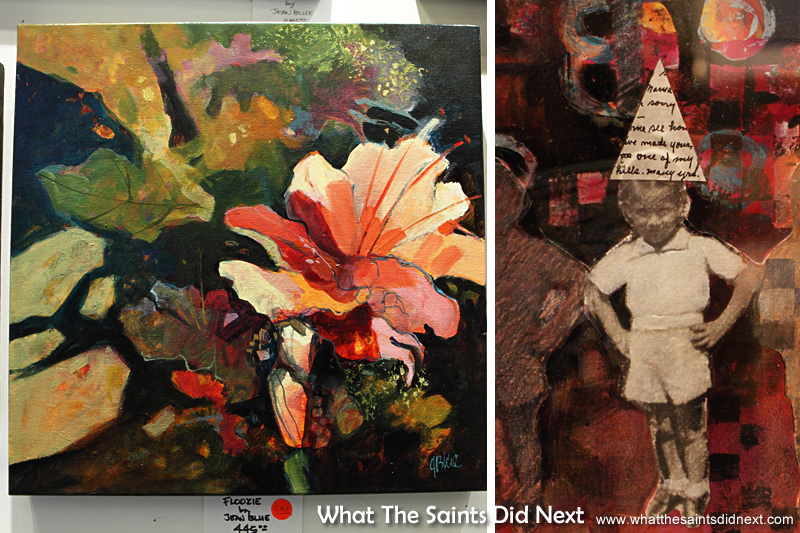 Jean Blue is “a native Mississippian” who taught art for 12 years after graduating from college in 1965. She was on duty at the gallery when we dropped in. How long have you been an artist? “All my life I guess, is really the answer to that.” Jean Blue shows us around the Attic. 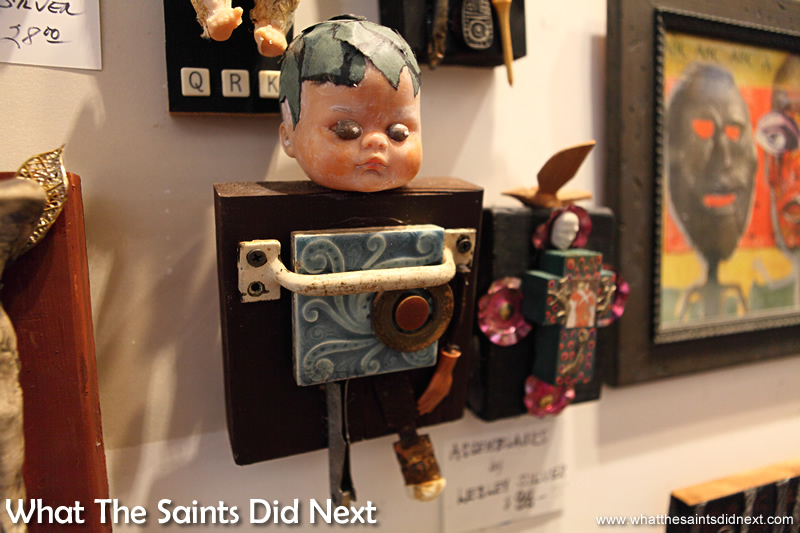 The ‘Chucky doll’ aspect of some of the artists’ work can take you by surprise. I can’t quite imagine hanging this in my house, but these pieces seemed quite popular judging by the number of them on display. 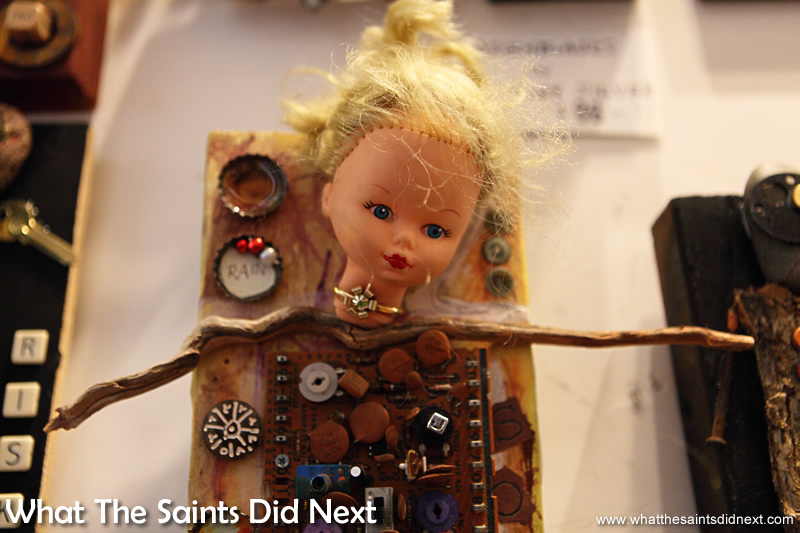 Brings a whole new meaning to ‘electronic toys.’ Inside the Highway 61 Attic Art Gallery, Vicksburg Mississippi. 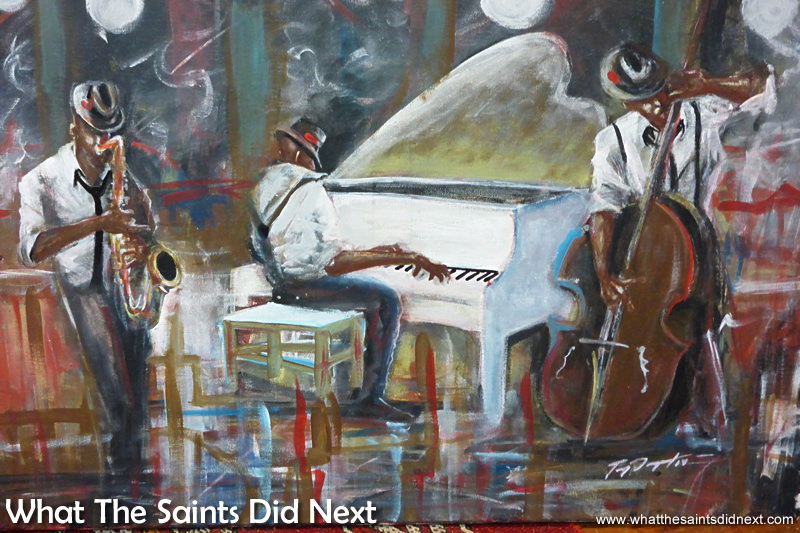 Mississippi Blues Music – a more convential offering, on canvas. One of Jean Blue’s collection. I was introduced to the stunning mixed media creations of South African Artist, Di Webb, a few months ago, at the Tangled Webb Gallery in South Africa. In the markets of Southeast Asia we gaped in awe at the gorgeous paintings and even in London’s Camden Market we were able to appreciate yet another collection and variations of art. The Highway 61 Attic Art Gallery, Vicksburg is unique, and yet the same in many ways. 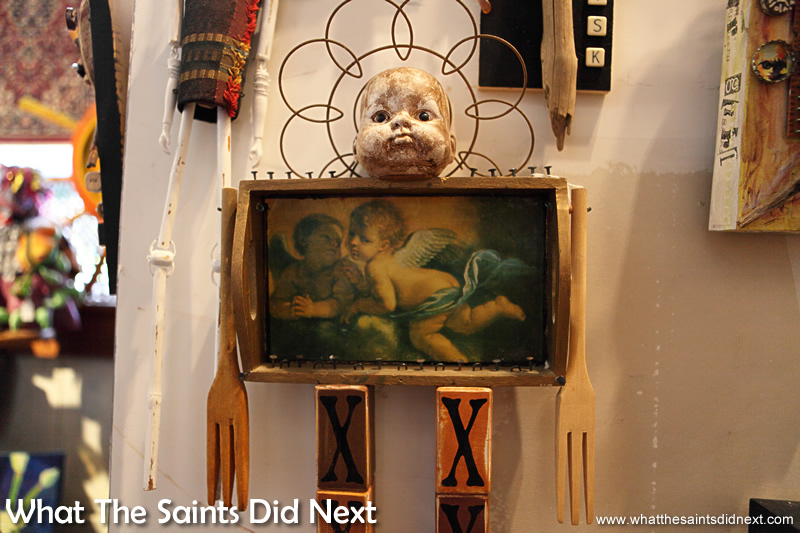 We more have expected to see this in the Voodoo shop in New Orleans. 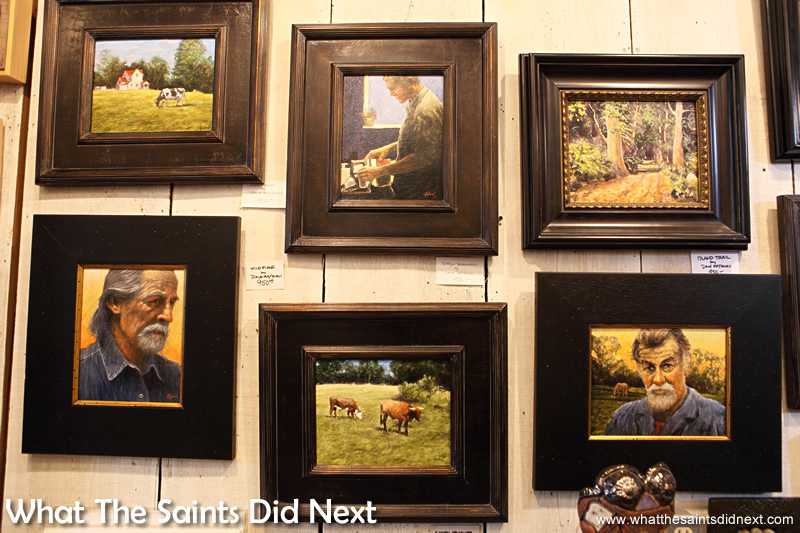 Traditional paintings in the Highway 61 Attic Art Gallery, Vicksburg hang alongside the quirky art. “There’s some notable Mississippi artists who come out of Vicksburg actually and so there’s always been a colony of artists. We have an active art association and we’re close enough to Jackson that we feed off their art community as well.” Jean Blue. 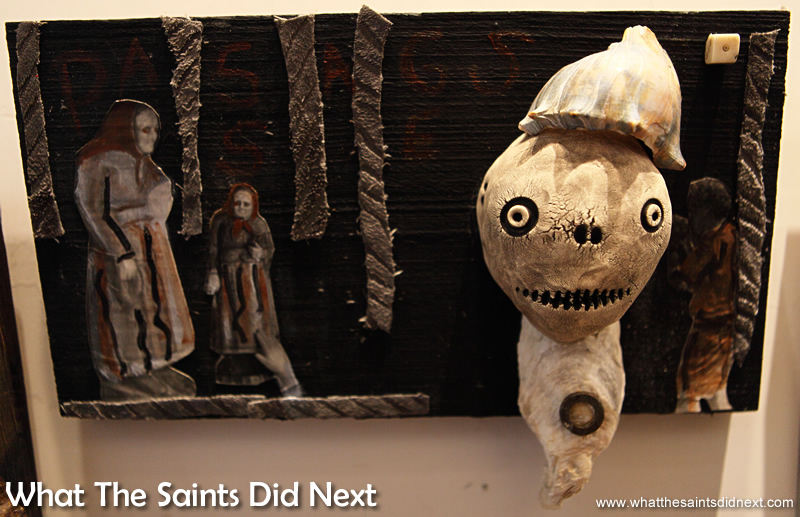 Highway 61 Attic Art Gallery in Vicksburg – One more ‘Chucky’ piece! ‘Walk up the steps for the unusual,’ as the sign says. 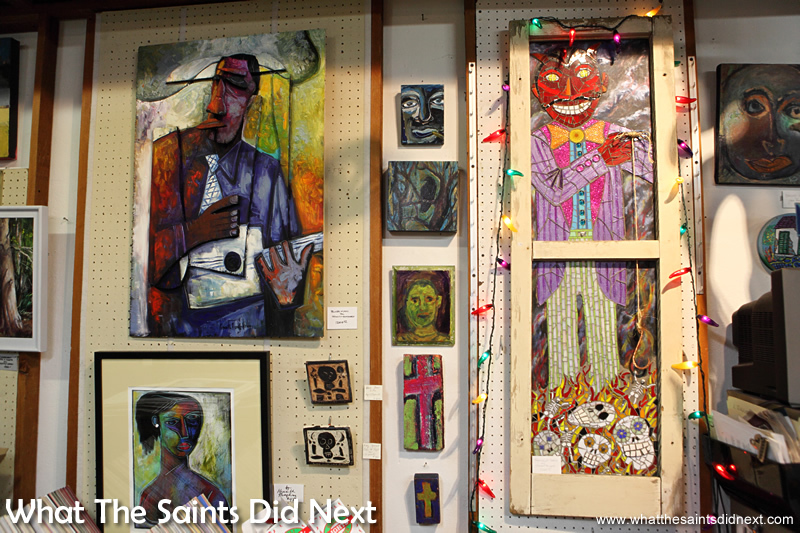 The Attic Gallery is the oldest independent art gallery in the state of Mississippi. 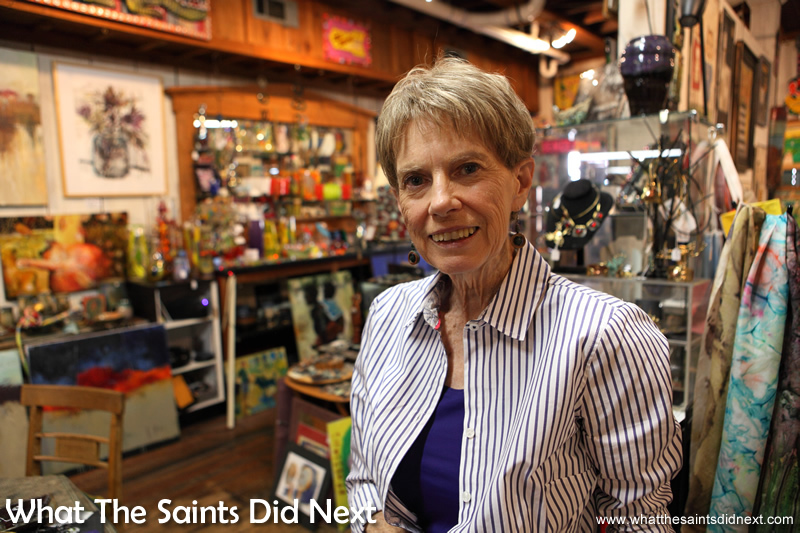 It’s interesting to learn from Jean that the art scene in Mississippi is thriving. In fact, the gallery often has to turn artists away because of a lack of space. The appeal of the road trip is the unplanned stops, the surprises and nuggets you find along the way. The Highway 61 Attic Art Gallery, Vicksburg is the perfect example of this, located directly above the Highway 61 Coffee Shop, on Washington Street. Whether you are blessed with talent or just someone with a camera like me, if Vicksburg is on your travels, do check it out. I highly recommend a visit. 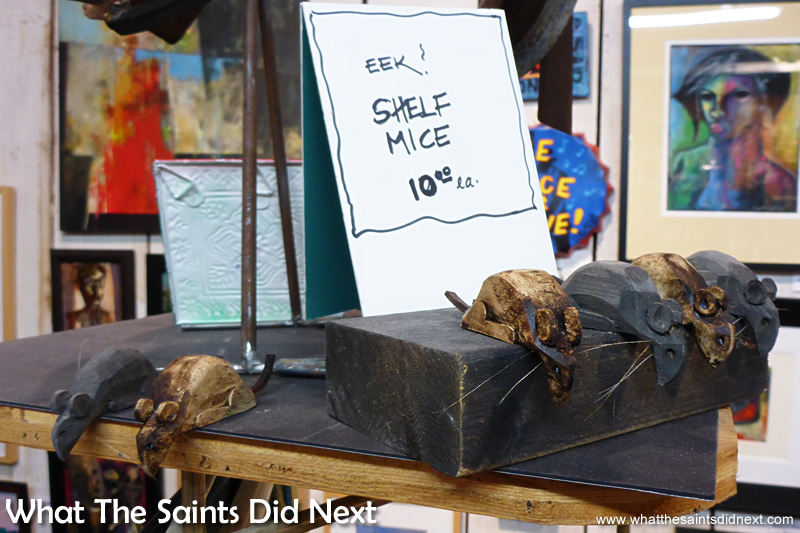 Oil paintings, pottery, mixed media, glasswork, recycled art… you come away from the Highway 61 Attic Art Gallery in Vicksburg looking at everyday objects very differently. Go check it out, 1101, Washington Street, Downtown Vicksburg.